Of course, we replied immediately and thought this would make a great article for everyone. And before we get into the nitty-gritty details, let’s look at the big picture. A Collaborating Need: A colleague and I are working on a project and we need to draft a proposal, together. I prefer using Microsoft Word, but she does everything in Google Docs. Instead of creating the project in Word and emailing it to her to upload to her Google Docs account, I simply loaded it to my Google account and “shared” the file with her. This way we are both able to view (and work) in the same document – at the same time. I can actually see her changes as she types in the file (and we aren’t sharing screens). 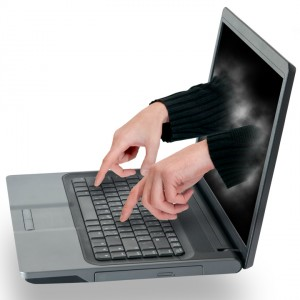 A Remote Access Need: You’re working on an important report, but you’re not always at the desk in your office. It’s due in a few days. You want to grab some work time when you’re at another location and at home. So, you move the Word document from your desktop folder and put it into your Google Docs. Now, when you have a few minutes offsite, you can reach into your internet folder and continue working. A Compatibility Need: OK, you’ve got a joint report to create with a colleague from another organization. You work with PCs; she uses a Mac. Sure, you can both use some form of Microsoft Word, emailing back and forth … or you can choose the neutral, mutually compatible software: Google Docs. This way you don’t have to worry about conversion mishaps. A Backup Need: Maybe you want another way to “back up” your documents. Files uploaded to your Google account are saved to protected (and backed-up) servers so it’s a great way to keep copies of important files. 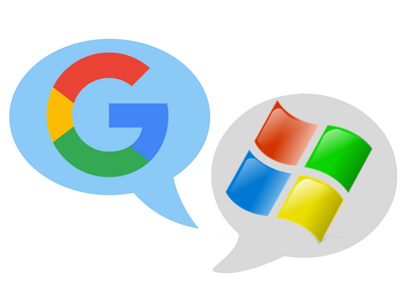 In the past, Microsoft and Google haven’t always “played well” together. But now it seems they are making the co-mingling of document types a bit easier. As we move to a “cloud-based” world, creating, editing and saving in a web tool gives you all kinds of advantages. By the way, this article isn’t a comparison or debate about which platform to use, but more of a “you’re most likely to encounter situations where you’re working with someone using a different platform than yours” — so knowing a few basics about sharing and conversion will be helpful. If you’re used to working in Microsoft Office documents, here are the equivalent types of Google programs and icons. NOTE: While Google and Microsoft office documents are different software programs, for the most part, they mimic each other. So when you move from one world to another, the content stays the same, but not necessarily the formatting. You may have to adjust such things as fonts, bullets or bolded text. To use Google products you first need to have a (free) account. If you don’t have one, go ahead and sign up. Then log into your account by going to Google.com and click the blue Sign In button in the top right. Once you’re logged into your account, a grid of boxes (see green circle in the image) appears next to your picture icon. This is how you access your collection of Google apps (programs) where Google Drive resides. You’ll see that the file organization in Google Drive (the “hub” for all your documents) is similar to Windows File Explorer. This is where files are stored including PDFs, images, videos and forms as well as Google Docs, Sheets and Slides. 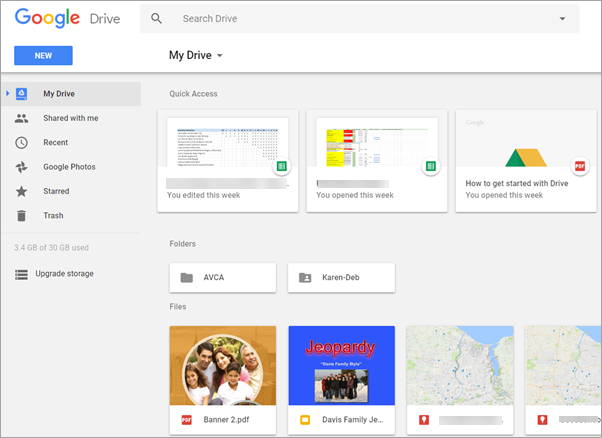 You can use Google Drive to just SAVE / STORE your files … and you can use its online tools to CREATE and EDIT documents. From your Google Drive account, click the blue New button and choose File Upload. Navigate to the file you want to load. Once loaded, click on the file name in Drive. 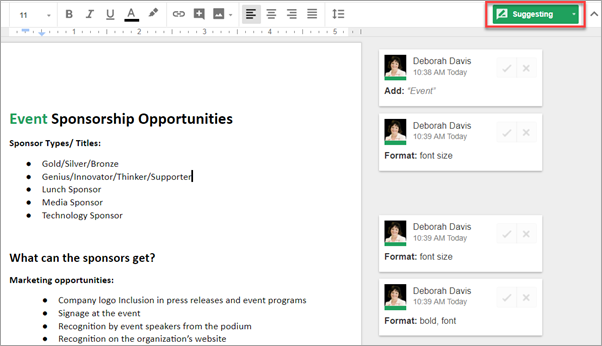 There will be a message at the top of the screen to “Open with Google (Docs, Sheets or Slides)” depending on the file type. Click that option to open in the corresponding program. NOTE: Some of the formatting may not carry over from the MS version. 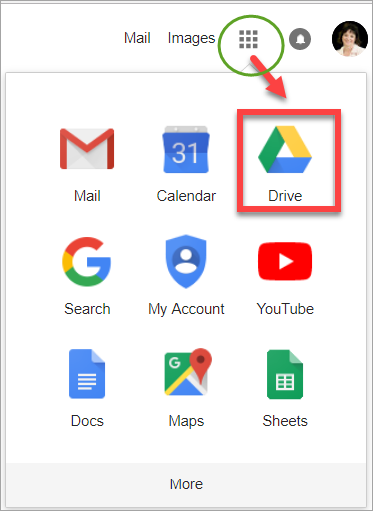 If you already have a Word, Excel or PowerPoint file saved in Google Drive, here’s how to convert it to one of the Google formats. Right-click on the file in Google Drive. Select, Open with and then choose Google Doc, Sheets or Slides. Your document will be converted. With the file open in either Google Drive OR in the app you’re working in (Docs, Sheets or Slides), go to File, and choose Download as. Depending on the file type, you’ll have format choices. 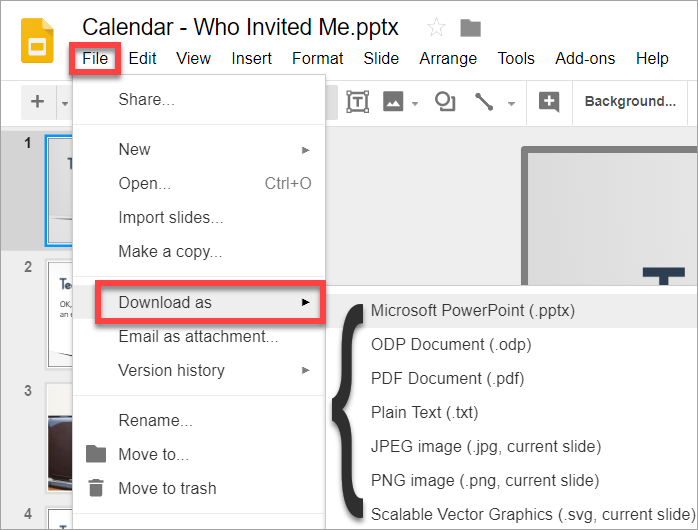 In the example below, the file is in Google Slides and we want to download it as a PowerPoint file. 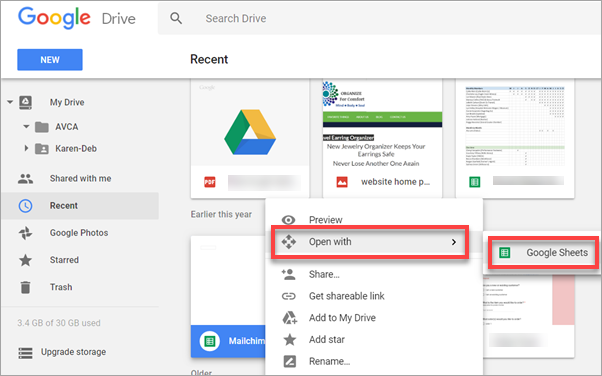 When you want to share a document you have saved in your Google account, there are a few ways to do this. If you’re in your Google Drive, hover over the file, right-click and choose Share. If you’re in the document, in the upper right corner click on the blue Share button. A Share window will open. Either click the “Get shareable link” in the upper right and paste that into an email to send to them. Type in the email of the person(s) that you would like to share. Use the drop-down menu under the pencil icon to select if you want to give the ability to Edit, Comment or just View the file. 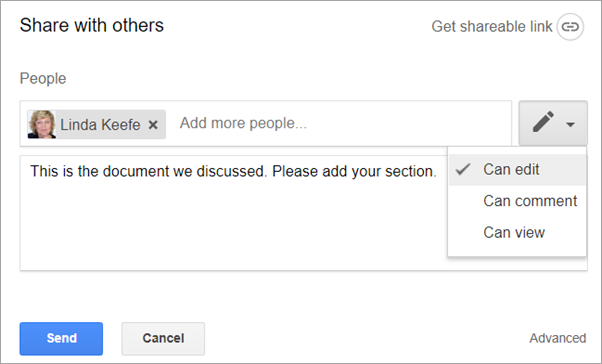 Google has now made it possible for you to “suggest edits” or “comment” in the Docs app — as we’ve always been able to do in Word. 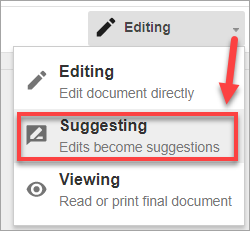 When you’re working collaboratively with someone on a document, you can turn on the Suggest Edits feature. This way any modifications you make in the document will be highlighted for the file owner to use or delete. When you have the Doc open, in the upper right, the default setting is set to Editing. Click the drop-down option to choose Suggesting. The changes you make in the document will be noted to the right for the author to accept or delete.